February 6, 1979 The crab fishing vessel Edna B was consumed by fire and lost 25 miles south of Seward. All four crewmembers made it to the beach and took shelter in a cabin. One of the four perished before they were rescued by the U S Coast Guard cutter Jellison five days later. The crew’s radio signal had been picked up by a man in Washington State and relayed to the Coast Guard in Alaska. February 28, 1979 The 139 foot Alaska Roughneck ran aground and rolled over in Cold Bay near King Cove. Skipper Eugene Love and deckhand Dan Buarnard were lost. Two others survived. March 30, 1979 Darren Kelly drowned in a skiff accident near Kodiak. April 20, 1979 Three people were lost from an unnamed small boat near Ideal Cove south of Petersburg. June 12, 1979 The 52 foot Restless C capsized in Hallo Bay. Two of the four crewmen were rescued by the vessel Awtam. The two lost were Ron Cochrane and H Q Hall. June 14, 1979 An unnamed private boat struck a submerged piece of ice and sank in Kotzebue Sound. Two of the three men on board crawled over the ice floes to shore but a third man was lost during the five hour journey. July 5, 1979 Three persons were lost when an unnamed skin boat capsized in the surf while attempting to beach near the mouth of Cripple Creek, 12 miles northwest of Nome in Norton Sound. July 5, 1979 The Japanese fishing vessel Hokuto Maru No 5 sank after a collision with the Japanese fish processor Tsuda Maru southwest of Saint Paul Island in the Bering Sea. Six crewmembers from the Hokuto Maru were lost. 20 other crewmembers from the two vessels were rescued by the U S Coast Guard. August 20, 1979 John Yakanak Sr of Kodiak fell overboard and was lost off of the vessel the Miss Diedre anchored in Akhiok Harbor. September 14, 1979 The barge Yakutat drug anchor and was washed to the mouth of the Kaliakh River where a large wave washed two men overboard and sunk the vessel. A 15 year old girl clung to the wreckage until she was able to swim to shore the following morning. Both men were lost. November 23, 1979 The 60 foot vessel Hellion was lost in a storm with 70 knot winds and 20 foot seas in the vicinity of Unimak Pass while hauling crab pots to winter storage at Beaver Inlet. Lost were captain/owner Ronald Hoffman, Walt Laughhead and Aaron Going. December 5, 1979 Three adults and seven children were lost from the Canadian gillnet fishing vessel Salintna. The gillnetter departed Prince Rupert, British Columbia December 2nd on a day trip to Portland Inlet. The Salintna was found badly damaged washed up on a beach at Tree Point, Alaska 46 miles north of Prince Rupert. There were no survivors. Lost were Roy Mostad (44), his three children Tommy (13), Robert (9) and Tina (9), Judy Stevens (30) and her three children Lyle (7), Nadine (6) and Roselle (4), and Wendy Stevens (27) and her daughter Angie (4). December 18, 1979 James Horsefield was lost when the 105 foot Columbia sank at Unalaska. 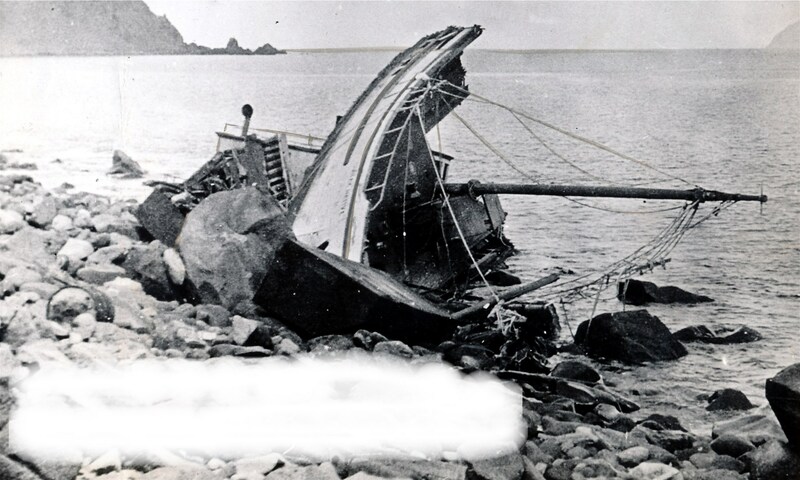 December 19, 1979 The fishing vessel Rough Draft wrecked near the Inian Islands off of Elfin Cove with the loss of the two persons on board. Lost were David Michael Kennedy and a second crewmember also named Kennedy. December 25, 1979 30 Taiwanese crewmembers perished when the 741 foot Japanese ore ship Lee Wang Zin struck a reef 60 miles north of the Queen Charlotte Islands in Dixon Entrance and capsized. The vessel drifted to Kendrick Bay on Prince of Wales Island where she grounded. The U S Coast Guard later attempted to tow the vessel to deep water and scuttle her, but she broke her tow line and sank nine miles south of Forrester Island In 1000 feet of water. My dad was the captain of the Rough Draft that sank December 19 1979. His name was David Micheal Kennedy. He was not found. His crewman’s last name was Kennedy also. He was found dead with life suit half zipped. Thank you for posting. Glad I found your site. Thanks for posting. I will add the information you have provided. RIP to those lost including your Father. In the book ALASKA SHIPWRECKS: Volume III – Southwest, West, Central and North Alaska, it is correct. Thank You Irene. I have corrected the owner information on this site as well as the spelling of Mr. Laughhead. I will edit my ALASKA SHIPWRECK books as well. Thank you for the information. RIP Ron Hoffman, Walt Laughhead and Aaron Going. This is a marvelous idea, and very well executed. I met, and borrowed money, from a young woman in Bristol Bay who had recently (mid-to-late 1970s) survived the sinking of a crab vessel (I believe) somewhere near Dutch Harbor, when she was plucked (in her survival suit) from the sea by a Coast Guard helicopter. If that story rings a bell, or better yet a name (there weren’t very many women commercial fisherpersons at that time), I would love to know it. She would appreciate repayment on her loan, at prevailing interest rates, after all these years. There were several dozen lady deckhands and a couple lady skippers I knew back then, but I can’t remember who survived a shipwreck. I know there have been several. I will keep an eye out and if I run across anything, I will contact you. I am looking for any record of my grandfather, James Louis Warner. He was the only survivor of a cargo tug boat wreck in southern Alaska. I know it was one of the major barge companies like Foss or Crowley and that the route was to Seattle. This happened around 1976-1979. I have not been able to find anything in my records that involved anyone named Warner. I was also unsuccessful in finding a James Warner in a shipwreck in newspaper files. There were a dozen or so tug losses in Alaska from 1975 to 1985, two of which had only one survivor, but both of those I have all the names and none is Warner. I will keep looking. Regarding the Lee Wang Zin,I was on that job and it was the M/V Salvage Chief,of Astoria Oregon, that was towing her, when she sank, and not the USCG ,as stated here.USCG and US Navy vessels stood off while we were towing her to 1000 fathoms where we would sink her but she sank right off of Dall Island. Tough job,we lost the tow once,rehooked and towed a 740′ ore carrier,upside down,slow going,we made about a knot speed.When she went down she reared up quick then sunk fast. Thanks for the heads up. I will edit and update the entry for the Lee Wang Zin. The entries for many of the thousands of wrecks that I am putting together are often abbreviated which sometimes creates a distorted version of the actual events. I am always appreciative of objective commentary that sets my records strait. The Ocean Pride sank in November of 1979 on the back side of Unimak Island. The crew was rescued by the Westward. No one was lost. Thanks Bob. I am updating and editing and ran across the Ocean Pride yesterday. Because it had so little information I didn’t know where it was lost. There have been many boats lost west and north of Unimak Island where the submerged Aleutian Canyon shallows up. I lost a good friend when the Lady of Good Voyage disappeared in that area in 1993. I am guessing you are related to the Ben Paz who was lost when the Pacific Trader capsized in that area. Sorry for your loss. I was on a boat that almost sank in the same area back in the 1970’s. We had sheltered on the south end of the Slime Bank waiting to see which side of Unimak a storm was going to track and unfortunately it decided to come onto the Bering Sea side. We barely made it to shelter behind Amak Island. In my entire fishing career that was the closest we ever came to losing the boat to weather. The 110 foot crab fishing vessel Pacific Trader capsized and sank February 7, 1980 north of Unimak in the Bering Sea. Jack Seagrave and Craig Seaborn were in survival suits and rescued by the fishing vessel Provider. Three others were lost including skipper Ben Paz of Dutch Harbor and crewmen Ken Morse of Soldotna and Carry Commack. Winds were at 40 to 50 knots and seas 10 to 15 feet. The fishing vessel Equinox was in radio contact with the Pacific Trader when she rolled over on her side. The Equinox put out a Mayday and more than a dozen fishing vessels and two U S Coast Guard aircraft responded to look for the missing men.